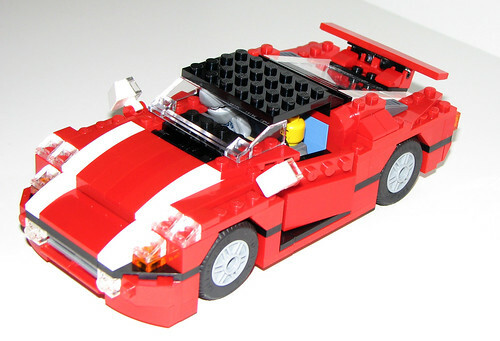 LEGO Creator 5867 Super Speedster – Minifig Scale? 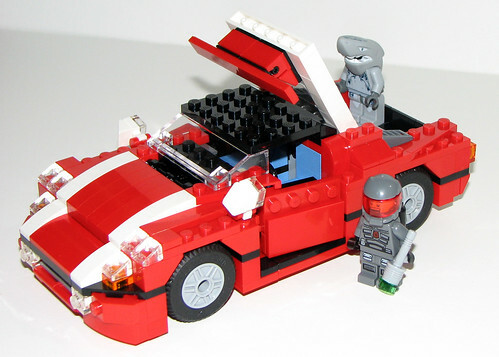 After seeing the comparison between the Creator 5867 Super Speedster and 8156 Ferrari, somebody worked out the actual size and asked me if the 5867 is minifig-scale. Luckily I caught the email right before I was about to tear down the speedster and work on the armored car build of it. Shark man from the Atlantis sets doesn’t fit too well, as you can see, thanks to his shark half. Complex (and proper) answer: If you were to change the seats, as well as change how the roof plate is supported, they would fit comfortably (minus any mini figures with large heads). The speedster is scaled to fit them if you make those changes. Changing it into a convertible might just be the easiest way to deal with the roof, and would allow you to work the seat tile back into the mix, raising the minifig so he can see over the steering wheel, but then you start getting into working on the dashboard…I would build it, look at what doesn’t work, then back up and tear it down to where you can work with them. 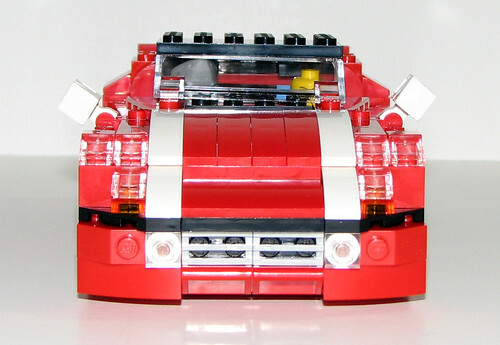 It would make for a nice compliment to the LEGO City sets. As for the armored car..possibly. The go-cart? No. Once I finish the other two builds for the review, I’ll take photos with minifigs for scale. The Creator 5866 Rotor Rescue is NOT scaled for minifigs.